1618 On Location brings the flavor, creativity and style of 1618 to events across the South. Whether it’s the casual menu of 1618 Midtown, the sit-down dinner feel of the Grille or a cocktail party with full bar services, On Location can adapt to any occasion. Sometimes a career path is determined early in life, as it was for On Location’s Catering Director Lauren King Donohue, who worked her first catering job while still in high school. That early taste of events and excitement set the stage for a lifetime of adventure in the hospitality industry. After working in restaurants, bars and catering companies for more than a decade, it’s fitting that she met her husband, 1618 Seafood Grille’s Sous Chef Adam Donohue, at the 1618 Midtown, which eventually became the location of their wedding reception. Executive Chef Harrison Simpson’s skill set is as diverse as his hot sauce collection. A near-architect turned engineer turned executive chef, Simpson was also a carpenter at one point in his life. Constructing palette-pleasing menus is his true passion, however. Simpson is industry trained and developed a deep love of flavor-driven cooking and a passion for growing his knowledge base, spending his free time watching cooking shows and researching recipes. His menus portray overt simplicity set against underlying complexity, and are often inspired by whatever ethnic-driven foods he’s recently eaten. Fayetteville, North Carolina native Angela Slabaugh broke her 10-year “restaurant sabbatical” in April 2016 by joining 1618 On Location as Events Manager. “Coming to 1618 reminded me how much I love the restaurant industry,” says Angela. It didn’t hurt that her first project was working an Eric Church event, a far cry from her start in the business – a burger joint – at age 16. The celebration business comes naturally to Angela. She’s a gifted musician who plays piano and violin, but also a talented cook, ready to entertain. To wit, there’s always Brut rose in her fridge. She arrived in the gate city via U-Haul in 2013 to attend UNCG’s Sign Language Interpreting Program, a fitting curriculum since she always talks with her hands. Shortly thereafter, she joined 1618 and is proud to say she’s done nearly every job in the restaurant – backwaiting, hosting, serving, bartending and working events – except for cooking. After hours, she can be found crafting with fellow 1618 family member Katy Bromley. How can you call something work when it excites you every morning? Nick Wilson does work at 1618 — he’s the Proprietor after all — but spending time at his Greensboro locations is more fun than anything else. OK, fun would be checking in via FaceTime from a cabin in the mountains, but you get the point. His favorite part of the job? Walking the line of trendy and traditional while assisting with the creation of a high-end beverage program with the latest and greatest beers, wines, bubbles and high-quality cocktails. Nick landed in Greensboro for college and loved it so much he never left, finding a permanent home here with his tenured, erudite husband Holt, who deserves endless praise — and probably presents — for allowing Nick to ply his trade during the odd hours of a restauranteur. His belief in community change through philanthropy have earned him the Triad Business Journal 40 Under 40 award, an Action Greensboro Made in Greensboro honoree and the Greensboro Chamber Small Business Person of the Year award. A native of Greensboro, George Neal literally grew up in city’s restaurant community, getting his start washing dishes while finishing at Page High School. 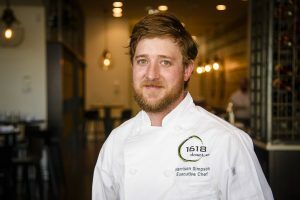 He worked his way up the chain (dishes begot pantry which begot grille which begot executive chef) before starting off on his own with the original 1618 location in 2004. George experienced two schools of culinary education: he learned through on the job training but also classically trained through his work at one of Greensboro’s former premiere French restaurants, Madison Park. George was the winner of the inaugural Fire in the Triad competition. In his free time, he can be found playing tennis, snowboarding and trying to avoid bogeys at Starmount. Feel free to contact us via phone (336.698.6698) or through the email form below. You can text or call us at any time. Tell us a little about why you are contacting us today so we can best help you.